Marketers can use e-commerce tools to sell from social media sites. If money makes the world go ’round, e-commerce takes the cybersocial world for a dizzying spin. There have been many different options for promoting or linking to your online store from blogs and social networks, but several applications now let you sell directly (or indirectly) from social media pages. Always check the terms of service on social media sites to be sure you aren’t violating their rules. Some services may prohibit selling directly from their site. The easiest way to sell from social networks and blogs is simply to post a banner or a text link to your own website or to other sites (Etsy, for example) that sell your products. Additionally, you can post images on a site like Facebook with links to your website or other sites. The British Corner Shop does this in a sophisticated manner. 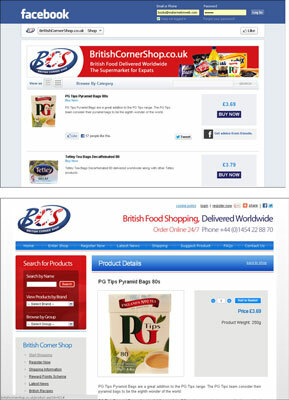 Clicking an item in their Facebook storefront takes shoppers to the British Corner Shop’s primary site to fill their carts and check out. 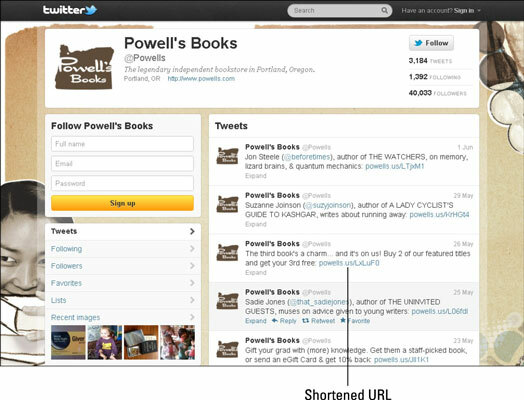 Powell’s Books does something similar using shortened links in its Twitter stream to take visitors directly to pages on its website. If you’re looking for a more seamless experience, consider e-commerce tools that display items on your blog or social profile (the portion of a social media service on which you describe your company) and then link to a third-party application or a web store to complete the transaction. For example, Wishpond integrates your Facebook presence with your e-commerce site. Users select their items on Facebook, but finish their checkout from your online store. E-commerce widgets are mini-displays of products; these changeable badges (which appear onscreen as a large button with multiple links) link to an existing web store. If you already have an online store, check your shopping cart or check stand provider (the section of your online store that totals orders and takes payments) to see whether it offers a widget for social media, too. Many vendors of online stores offer widgets with functionality equivalent to third-party shopping apps for use on some compatible social media services. For instance, Zazzle.com offers both a Merch Store application for Facebook and a separate Merchbook widget for Myspace; PayPal offers widgets for TypePad blogs, Facebook, and Myspace. By comparison, a virtual storefront on a social media service either imports products from an online store already in place on your own website or allows products to be uploaded directly from a freestanding, online store like Etsy. At the check stand stage, these storefronts link to your regular web store or to a third-party site to process the transactions. Although virtual storefront strategies may be a useful way to cast a wider net for customers, they may complicate your recordkeeping when used in addition to a web store. E-commerce tools, which let you promote and sell only your own products, are quite different from social shopping services, which aggregate products from multiple sources, often suggested by consumers themselves and linking viewers back to your website. Third-party e-commerce tools that link to PayPal or other payment services generally don’t integrate with inventory and accounting packages as a full-featured, shopping cart on your website might. If your business inventory system doesn’t link to the shopping cart on your website, you may need to adjust those records manually. If you use a virtual storefront in addition to an existing store on your own website, but don’t track inventory automatically, here’s another way to track the source of sales. For tracking purposes, you could separate SKUs for products that will be listed on different online store locations or set a different price: for example, discounting items specifically for your Twitter audience. This approach wouldn’t work with automated inventory controls.